For the first time in over a decade, the Pentagon’s budget has to shrink, thanks to a deal to cut the deficit that Congress and President Obama struck last year. Yet a key Senate panel voted on Thursday to fund big-ticket hardware — ships, cargo planes and drones among them — that the U.S. military is trying to get rid of in the name of saving cash. When the Pentagon rolled out its requested budget in February, there were some conspicuous absences. The a version of the Air Force’s high-flying Global Hawk surveillance drone, known as the Block 30, was chopped. So was the C-27J, a propeller-driven cargo plane used for Afghanistan. For its part, the Navy opted to retire nine old ships and reroute the cash it would take to modernize them into other priorities. If the Senate Appropriations Committee, one of the two most powerful in Congress, gets its way, that’s all out the door. On Thursday, the committee voted to approve a $604.5 billion defense budget for the next fiscal year. It’s about $100 million less than what the Obama administration asked for. But it still includes money for the Global Hawk Block 30; the C-27J; and those nine old Navy ships. All this goes to show how difficult it is to actually cut the defense budget. Even when the military agrees to make what critics would consider modest cuts, legislators keep shoveling cash into the Pentagon’s pockets. That’s nothing new in Washington. What is new — and pretty astonishing — is for a Senate panel to do that while legislators demand to shrink the federal budget overall. 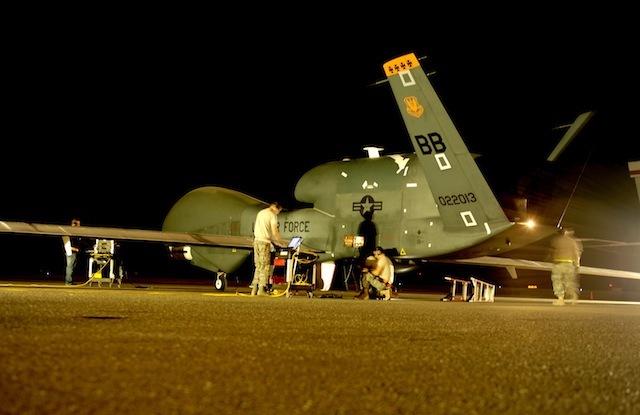 Without much elaboration, the committee’s report on the fiscal 2013 defense appropriations bill requires the Air Force to “complete the execution of funds previously authorized appropriated for Global Hawk Block 30.” That was a key priority for manufacturer Northrop Grumman. The Air Force decided in February to stop buying the Block 30, stranding 10 of the $218 million drones on the production line. While the Air Force wants to stick with the next-gen Block 40 version of the Global Hawk, it determined that the Block 30 wasn’t a fit replacement for the hoary old U-2 manned spy planes. Same goes for the C-27J. Schwartz stated that budget constraints required him to shrink the Air Force while buying key planes to make it a “smaller but superb force that maintains our agility, our flexibility and readiness.” Since the C-27J is primarily used for a conflict that’s winding down — Afghanistan — it made sense to put the plane in “recoverable storage” out at its airplane graveyard in Arizona. The Senate panel is unconvinced. It wants the Air Force to keep funding the “new, highly capable” C-27J. The cost? An extra $137 million. That’s a significant chunk of the $257.6 million the Senate Appropriations Committee added to the Air Force’s aircraft-purchasing budget. Then there’s the Navy. Congress clearly doesn’t like the Navy’s plans to slightly cut its shipbuilding plans. The Navy proposed to retire old seven cruisers — the USS Cowpens, Anzio, Vicksburg, Port Royal, Gettysburg, Chosin, and Hue City — along with two transport docking ships, the USS Whidbey Island and Tortuga. Its thinking was that it could retire the ships a few years early; pocket the money it would spend on maintaining them; and put that into other priorities, including shipbuilding, down the road. But the Senate panel wrote it was “troubled” by that decision. “The committee is concerned that the operational impact of this reduction in force structure on the balance of the Fleet as it attempts to meet requirements in the Asia-Pacific, as well as demands in the Middle East and other parts of the world,” the committee writes. It warned that the nine ship retirements “creates unnecessary and unaffordable future shipbuilding requirements,” as the Navy doesn’t have a good track record of saving money to buy the ships it says it needs. And it’s willing to spend cash on the ships. The panel added $2 billion to the administration’s shipbuilding proposal, raising it to $15.6 billion next year. Mitt Romney, the GOP candidate for president, wants to boost it even more — and turn shipbuilding into an issue for the November presidential election. It’s possible that the appropriations committee’s work is for naught. The full Senate has to vote on it, and it has a little over 24 hours until Congress goes on its August recess. When it returns, normal Congressional work will operate in the shadow of the presidential election, which doesn’t usually mean productivity. In fact, it’s looking like Congress will opt to punt in September — that is, pass something called a “continuing resolution,” which basically extends last year’s budget for another six months. Even so, the Senate panel’s work should put the Navy and the Air Force on notice that its grand budget plans are running into stiff Hill opposition.